World War Z meets Snowpiercer in this Korean zombie blockbuster. Imagine World War Z and Snowpiercer mashed together. That roughly describes Train to Busan, the highest grossing South Korean film of 2016. With almost $100 million in box office earnings and over ten million domestic viewers, the movie is not only an entertaining blockbuster, but also a remarkable live-action debut for a director who previously was known exclusively for dark, socially critical animated features. Train to Busan stars Gong Yoo (best known for his breakout role in the drama The 1st Shop of Coffee Prince) as a hedge fund manager named Seok-woo who decides to take his young daughter Soo-an (played by the ten-year old Kim Soo-an) from Seoul to the southern city of Busan to see his ex-wife. As they depart on the KTX (South Korea’s high-speed rail line), Seoul erupts into a zombie apocalypse and their train becomes a speeding safe haven. However, that doesn’t last for long. A single zombie makes it onto the train and starts infecting passengers. This forces Seok-woo, Soo-an, and other survivors to quarantine themselves in uninfected cars and fight for survival. As expected from a zombie apocalypse movie, there’s a gratuitous amount of violence and many shots of rolling zombie hordes a la World War Z or 28 Days Later. The film maintains a high degree of suspense throughout. It also creates both likeable and absolutely despicable characters for audiences to root for, cry about, or hate. With such an altogether entertaining makeup, it’s not surprising that Train to Busan sold so many tickets. Interestingly, this represents a significant change for Yeon Sang-ho, the film’s director. Before this, Yeon had only made short films and animated features, none of which were box office flops. His two features King of Pigs and The Fake (which we reviewed last year), are blisteringly dark and deal with mature, controversial themes like the hollowness of religion, domestic abuse, bullying, and class divides — hardly the stuff that attracts mass audiences. Ruthless businessman: probably everyone’s least-favorite character. 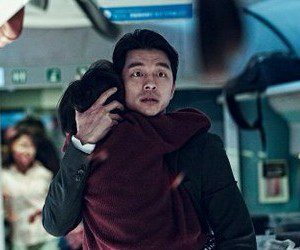 However, signs of Yeon’s guiding hand are evident in Train to Busan if you look deeper. Like another well-known Korean train movie, Snowpiercer (directed by Bong Joon-ho), Train to Busan incorporates elements of class warfare and uses the claustrophobic setting of a speeding train to amplify the darker angels of human nature. The Korean government is largely absent or, if present, unhelpful — the only time a government representative comes on TV, he tells people that the situation is under control when it clearly isn’t. Amidst the chaos, a ruthless businessman takes command of one of the train cars and orders the crew around to the whims of his self-interest. The hordes of zombies are juxtaposed against symbols of Korea’s material wealth — the shiny KTX train cars, immaculately designed train stations. It’s an ironic image: despite their outward trappings of civilization and modernity, the people are still monsters. People being monsters — you could say that’s the unifying theme of Yeon Sang-ho’s work. With recent events in Korea, perhaps people are now more receptive to what he has to offer. When you have the nation’s Prime Minister calling 99% of the population “dogs and pigs”, an overloaded ferry sinking due to corporate greed, and public distrust of the government’s ability to handle viral outbreaks, maybe a zombie apocalypse starts to have some appeal. Seoul Station: Yeon Sang-ho actually made this animated prequel to Train to Busan and also released it this summer. For all of Train to Busan’s success, this prequel has gotten surprisingly little publicity. The Fake: Yeon’s second full feature, a biting and thoughtful satire of organized religion. Doomsday Book: Train to Busan is actually NOT the first South Korean movie to feature a zombie apocalypse — Doomsday Book is. Snowpiercer: A Korean-produced English-language movie (starring Chris Evans) that depicts a class struggle aboard a train speeding through an icy post-apocalyptic Earth. 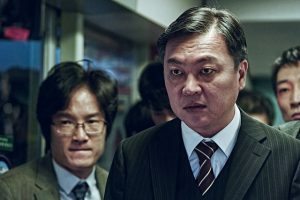 Directed by Bong Joon-ho, who also made Memories of Murder and The Host (the latter, which is essentially a South Korean Godzilla, is also worth watching). Train to Busan (Korean: 부산행)–Dialog in Korean. Directed by Yeon Sang-ho. First released 20 July 2016. Running time 1hr 58min. Starring Gong Yoo, Kim Soo-an, Jung Yu-mi, and Ma Dong-seok.